The emerald archer of Seattle has been a public issue, as of late. Some view him as a hero… others, as a menace. Reporter Victoria Much gives a full story on Green Arrow. She discusses how recently, the fugitive was seen at Queen Industries. Allegedly, the vigilante set off a bomb in the office of the company’s CFO, Cyrus Broderick. Arrow escaped after this incident, assaulting several officers in the process. Meanwhile, the city is still reeling from a disaster after the Empire Express was derailed. There are conflicting reports over what happened during this, but the Green Arrow remains a person of interest in both the train crash and the subsequent assassination of noted diplomat and peacemaker Amin Mustafa. Victoria interviews several people in the city. A police officer views him as a criminal, and others agree, while some citizens view him as nothing but a hero. One woman, Maureen Lynch, claims Green Arrow broke into her home and forced her to donate half of her salary and a truck load of epi-pens to a local hospital. She doesn’t care if it was tax deductible, it was robbery, plain and simple. A family Victoria interviews gives a different story, as the Green Arrow saved this family from slave labour when nobody else could. With the public unsure what to make of all this, Victoria’s investigation continues, while the city wonders who this emerald archer is, and where does he hide among them. Outside of Seattle, in the wilderness, Green Arrow and his friends are setting themselves up in the woods. Oliver is focused on clearing his name and getting his company back, but Black Canary warns him that the last time they tried this, Oliver Queen had to publicly die. 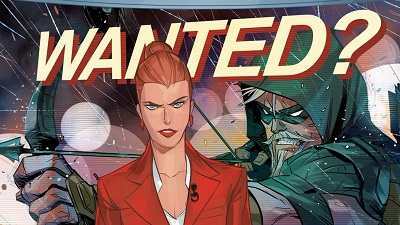 Green Arrow is all that Ollie has left, and the city needs him. She insists they aren’t just building a tree house out here… it’s the start of a new life. Back in the city, a cop forcible attacks a man and begins to brutally beat him. His attack is short lived when Green Arrow arrives on the scene and attacks the office. Insisting that he will not tolerate the abuse of power, the emerald archer incapacitates the cop while a woman films the whole thing. This video goes viral, and pretty soon the Seattle Police Department draws sharp criticism while public opinion on the Green Arrow moves vastly in the heroes favour. The officer in the video, Sergeant Notting, is now on administrative leave while the police investigate the incident further. Later, at the Seattle City Hall, mayoral candidate Nathan Domini holds a rally. His family built a legacy through lumber. They worked hard, put themselves first, and other people benefited because of it. Money doesn’t go on trees, so it’s time to reward the hard workers of this economy f irst and foremost. A woman in the crowd cries out that Domini’s family laid her father off. Nathan is dismissive of this, and orders his followers to get rid of her and not to be nice about it. Thanking the crowd, Nathan takes his leave and enters his car. He is surprised to find his driver is none other than Oliver Queen, who is supposed to be dead. Ollie explains that he’s only pretending to be dead out of convenience. He needs a favour from Nathan, and, as old friends, he hopes the politician can help him out. Nathan scoffs at this, and though they go back a ways, things have changed. Domini didn’t even like Oliver even before he was accused of murder. Ever since Queen went to that damn island he became a liberal blowhard, and Nathan wants nothing to do with him. Just the same, Oliver leaves a special recording device that he’d like to plant of Queen Industries head Cyrus Broderick, hoping that Nathan will change his mind. Later that night, Queen and Black Canary scope out an abandoned drug house. Oliver refuses to say where he was, not wanting her to know about going after Cyrus. They are surprised to find that whoever was here left behind a lot of drugs that could have been sold but were instead abandoned. Additionally, whatever happened here, based on the gunfire, the encounter was violent. These thoughts are interrupted when a homeless man arrives to collect some scrap metal. The stranger agrees to tell them what happened here in exchange for one of Oliver’s arrows, which our hero happily obliges. The homeless man draws out an image of the people that did this – all dressed in strange garb. Oliver and Canary share a worried look. Elsewhere, Cyrus sits, musing openly about disasters. The things people who survive these events remember are not the disasters themselves, but the morning that they happen. They remember how it was such a clear and sunny morning. They remember the beautiful. As if the world tricked them into thinking everything will be okay. That’s where Green Arrow is now: Under a terrible blue sky. Only later will he realize this was the beginning of catastrophe. As Cyrus, has learned, the emerald archer is surprisingly difficult to kill. He has a better plan though, something far more toxic. Oliver Queen has nothing left but Green Arrow. But pretty soon, they’ll be taking that away from him, too. They’re going to turn the entire city against him. Well, this was great, just a great, fine comic overall. We haven’t actually ever reviewed a Green Arrow comic or really talked about this character much here on Comic Island, so it was a nice change of pace to check things out here. I’ve got to say, I was really impressed with this series. For me not knowing anything, really, going into this issue, this comic did a great job at filling in the blanks and introducing a new and fun story. The only thing I don’t know is why Arrow has relocated to Seattle, but I kind of just go with it and enjoyed this issue just the same. Because there’s a formidable story here. It’s quite impressive just how much story is in this one little issue. Writer Benjamin Percy really has a handle on this story. It quite elaborate, but it’s so well structured it is easy to follow, while there’s a lot of great character work in each and every scene that makes it a great story. I like how even small roles like the homeless man feel like real characters. He has a brief interaction with our heroes but it’s a solid dynamic that pays of nicely, and the way he draws out these mysterious figures reflected the character’s quirks while also hinting at something… more, on the way. It’s a solid mystery they set up in this scene that I really appreciated. I love the art – it’s a great blend of realistic and cartoony that just works for me. The way Arrow and Canary’s hair almost looks white in certain lights is a really cool effect artist and colourist Otto Schmidy achieves, and, in general, he does remarkable work at using the colours to convey the different beats of the story. At first, everything is bright and optimistic, but when the ball drops and those people start getting killed, suddenly, there’s red. Red everywhere, and it’s both brilliant and kind of lovely to look at, even though a bunch of people are being brutally murdered. How fun! It’s an impressive comic. One that manages to take a lot of old story ideas and plot lines and provide just enough twists on them to make things feel fresh. I admit, some of the political content is a little on the nose, and this Nathan character is a bit obvious for my tastes. Yet, in spite of that, Green Arrow has pretty much always been a pretty political character, so it’s hard to be upset about this if you really know your DC history, and, you know what? Nathan thus far seems like a pretty fun character. He’s not heroic, but he’s not irredeemable, either. He has qualities that I can respect and I get why he would be popular in this fictional version of a very real city. DC doesn’t often opt for real world locations like this. It’s an interesting choice to pick Seattle as the setting and I’m curious if more will come of that. I do know Green Arrow has operated out of Seattle before, so perhaps this is a callback to that time period. There are lots of little references like that in this comic. My favourite is the name Sergeant Notting, a clever little reference to the Robin Hood stories from which Green Arrow draws inspiration. Little details like that go a long way in making a comic great, and yeah, all told, this was a pretty great issue. All told, I recommend this comic.